Earn $200 after you spend $1,000 on purchases within the first 3 months. Terms Apply. Cardholders earn 6% back at U.S. supermarkets up to $6,000 in purchases each year (then 1%), 3% back at U.S. gas stations and 1% back on other purchases. You'll earn $150 after spending $1,000 in purchases within the first 3 months. Terms Apply. 13.99%-24.99% Variable APR will apply. Based on your creditworthiness and changes in the prime rate. Overview: Earn 6% cash back at U.S. supermarkets up to $6,000 in purchases (then 1%); Earn 3% cash back at U.S. gas stations. Blue Cash Preferred® Card from American Express (a SmartAsset advertiser) may be a good fit for those looking for big cash-back rewards with limited restrictions. As with other cash-back credit cards, users can earn 1% cash back on most purchases (fees or purchases of cash equivalents like traveler’s checks are not included). However, the true value of the Blue Cash Preferred® Card comes from the rewards it offers on U.S. supermarket, gas, and select department store purchases. Each year, users of the card can earn 6% cash back on their first $6,000 worth of purchases from U.S. supermarkets (1% afterward), which can amount to big savings for a frequent supermarket shopper. Moreover, you can earn 3% cash back at U.S. gas stations and 3% cash back on purchases at select U.S. department stores such as Macy’s or Bloomingdale’s. Shoppers who register also get the added benefit of return protection of up to $300 per purchase and $1,000 per year for eligible unused items that the seller refuses to refund. 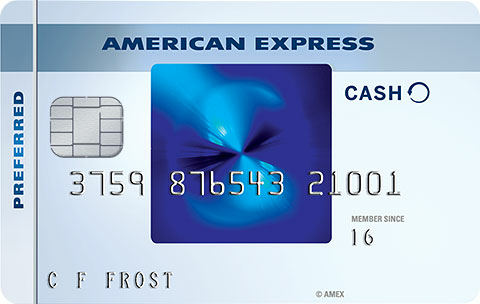 With significant cash-back rewards, and the opportunity to earn up to $200 back, the American Express Blue Cash Preferred® Card may be well worth its $95 annual fee. Foreign Transaction Fee: 2.7% of each transaction after conversion to US dollars.% of each transaction in U.S. dollars.